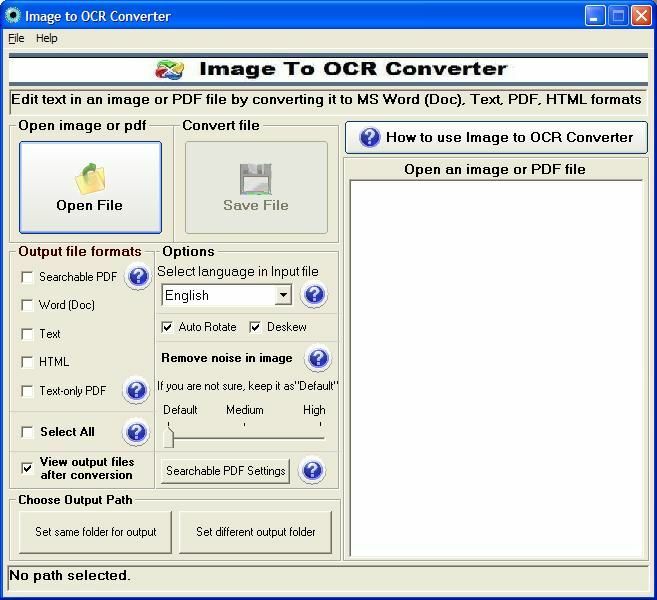 Image to OCR Converter is a text and character recognition software that converts images, Image-only pdf, bmp, tiff, jpg, png, tif files to searchable and editable MS Word, pdf, doc, text, html files with accurate text formatting, spacing and fonts. Image to OCR Converter recognizes more than 40 languages and also provides password protection to output files. It detects and corrects orientation, rotation, skew and tilt in input image files. Image to OCR Converter recognizes more than 40 different languages. Images, pdf and scanned documents in any supported language can be converted back to the original language text complete with all language fonts and styles. Image to OCR recognizes English, German, French, Spanish, Italian, UK English, Swedish, Danish, Norwegian, Dutch, Portuguese, Brazilian, Galician, Icelandic, Greek, Czech, Hungarian, Polish, Romanian, Slovak, Croatian, Serbian, Slovenian, Luxembourg, Finnish, Turkish, Russian, Byelorussian, Ukrainian, Macedonian, Bulgarian, Estonian, Lithuanian, Afrikaans, Albanian, Catalan, Irish Gaelic, Scottish Gaelic, Basque. Image to OCR Converter provides security features such as password protection and watermark to the converted documents. The password protection prevents others from viewing or copying your document's content. Files can be watermarked to prevent illegal distribution. A powerful pcl to image converter, supports PCL4, PCL5e, PCL5c, PCL XL(PCL6). Convert PowerPoint PPT to Jpeg/Jpg/Tiff/Bmp/Eps/Ps/PNG/PCX files format. Qweas is providing links to Image to OCR Converter 1.2 as a courtesy, and makes no representations regarding Image to OCR Converter or any other applications or any information related thereto. Any questions, complaints or claims regarding this application Image to OCR Converter 1.2 must be directed to the appropriate software vendor. You may click the publisher link of Image to OCR Converter on the top of this page to get more details about the vendor.